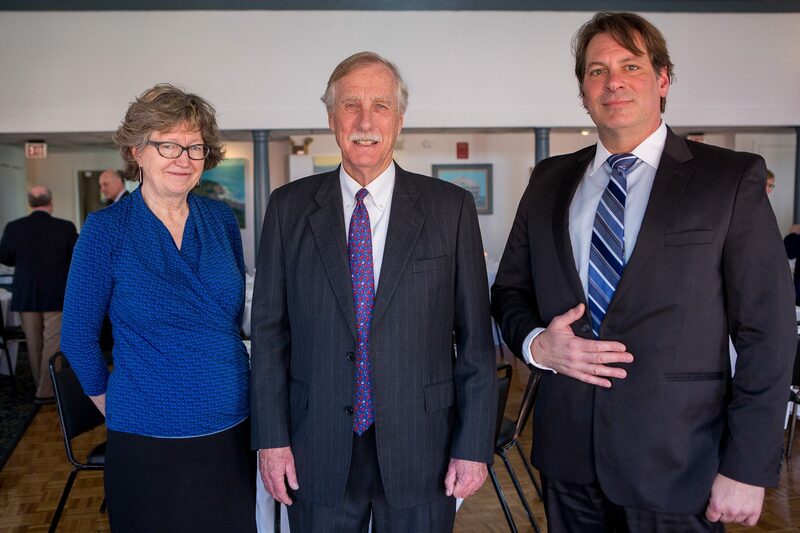 News > Press Release > Attorneys Nan Heald and Stan Tupper honored by Maine Justice Foundation; Senator Angus King presents Howard H. Dana, Jr. Award and New Lawyer Award. 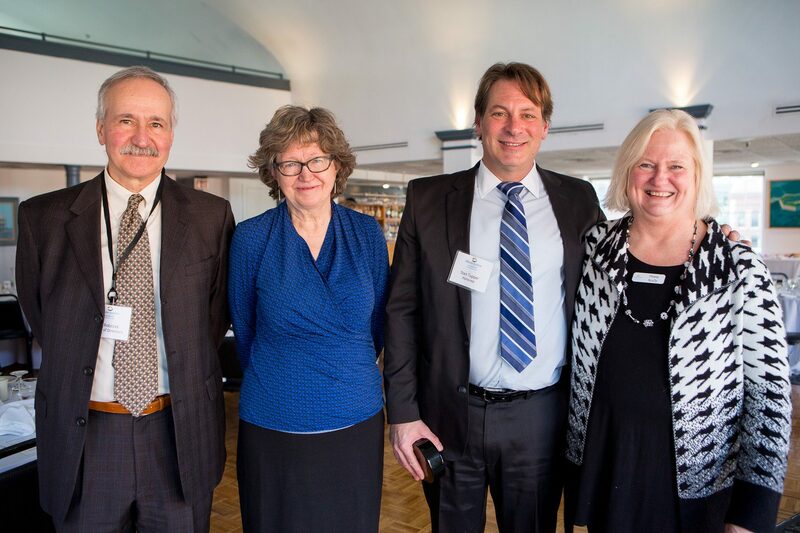 The Maine Justice Foundation, at a breakfast event on March 5th 2018, honored two Portland attorneys who exemplify the foundation’s mission to ensure that all Maine people have access to the justice system. Maine’s U.S. Senator Angus S. King, Jr. presented the Howard H. Dana, Jr. Award to Nan Heald of Pine Tree Legal Assistance and the New Lawyer Award to Stanley R. Tupper, III of Frederick, Quinlan and Tupper. Chief Justice Leigh I. Saufley introduced Senator King at the event. In 1984, the then-Maine Bar Foundation established an award to be presented annually to a Maine lawyer to recognize significant contributions to enhance access to civil legal assistance for poor and vulnerable Mainers and outstanding service in the advancement of the Foundation’s goals. In 1988, this award was named for Justice Howard H. Dana, Jr., a Foundation leader and dedicated advocate for equal justice for Maine people. The Maine Justice Foundation’s Board of Directors voted to present the 2018 Howard H. Dana Award to Nan Heald. Nan grew up in Oquossoc, Maine. She joined Pine Tree Legal Assistance (PTLA) as a staff attorney in the Native American Unit in 1985 to work on federal recognition of the Aroostook Band of Micmacs. She has served as Executive Director since 1990. Under her leadership, PTLA launched the state’s first children’s law project, expanded support for self-represented families and victims of domestic/ sexual assault, and provided support for those facing foreclosure, housing discrimination and other issues. Nan has been an innovator in making legal services more accessible to underserved rural and native communities. One example is the website PTLA.org the first legal aid website to offer self-help resources. With financial support from the Legal Services Corporation, PTLA embarked on an ambitious project to provide StatesideLegal.org—online self-help legal resources for U.S. military and veteran families worldwide. Foundation Executive Diana Scully says, “There is no one in Maine who has done more than Nan Heald to help low income and vulnerable Mainers receive legal aid when faced with life-changing civil legal issues. And there is no one in Maine more deserving of the Howard H. Dana Award than Nan. Established by the then-Maine Bar Foundation in 2011, the New Lawyer Award (also fondly known as the “Arnie Award” for Bernstein Shur attorney Arnold Macdonald) is for outstanding lawyers, licensed to practice in Maine for fewer than ten years, who: exemplify the ideals of increasing access to justice; make outstanding and recognized contributions to the legal profession and public good through pro bono service or other contributions; and demonstrate a strong commitment to the objectives and purposes of the Foundation. The Maine Justice Foundation’s Board of Directors voted to present the 2018 New Lawyer Award to Stanley R. Tupper, III. A principal at Frederick, Quinlan and Tupper, Stan earned his law degree from the University of Maine, School of Law in 2014 and was honored to deliver the valedictory address to the Class of 2014. At Maine Law he participated in the Moot Court team and travelled to New Orleans for the Judge John R. Brown Moot Court competition. He also spent a semester at City University of Hong Kong, where he developed contacts and relationships with key players in the international trade community. Since graduation, Stan has made significant contributions to access to justice. Through MSBA’s New Lawyer Section, he has taken on the leadership role for Lawyers in Libraries and the annual Pro Bono Fair. Stan serves on the Campaign for Justice Cabinet and Steering Committee. Before law school, Stan had ten years of experience running a slip-cast ceramics production business. He also worked as a general contractor on residential construction projects, managing teams of tradesmen to complete projects correctly and on time. Stan also has constructed boats and experimental aircraft. He is a licensed pilot with a seaplane rating. In 1983 the Maine State Bar Association and the University of Maine, School of Law created the Maine Bar Foundation as the charitable arm of the Bar. Since then, the foundation has supported access to justice for poor and vulnerable Mainers with millions of dollars in grants to organizations providing legal aid services, advocacy, and education. In 2015, we changed our name to the Maine Justice Foundation and have undertaken additional efforts to increase the amount of private dollars available for this purpose. We are one of the top 20 foundations in Maine, with grants of $1.5 million in 2017.